2 What is Factor 75? 3 What are the prices on Factor 75? 5 How do the meals taste? Factor 75 is a good delivery company based out of Chicago that takes away all the work of shopping for ingredients, prepping your food, and cooking your meals. A lot of people believe that hiring a personal chef will be the best bet for them, time wise, because a chef does all of the leg work for you- you just have to eat it. However, a big complaint that a lot of people had when it comes to hiring personal chefs is that if you ask the chef to cook for you based upon certain macro nutrients, they end up cooking the same meal over and over again. 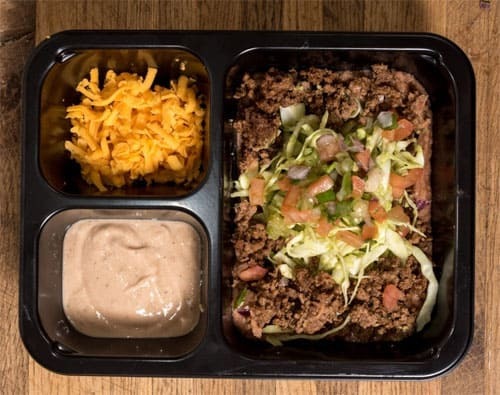 What makes this meal delivery so great is that they don’t target people who are interested in losing weight, like so many other meal delivery services do. Matter of fact, Factor 75 looks to provide a service to people who are interested in maintaining or gaining weight, as they served a lot of high protein, high calorie meals that are also friendly to people who are interested in paleo diets or people who have problems with dairy. With each meal that you select for delivery, Factor 75 tells you all of the ingredients and nutritional information that’s listed in that meal. Did you know that 75% of fitness comes from what we eat? That’s why Nick Wernimont created Factor 75 in 2012, in response to learning that 75% of our fitness comes from the meals we eat! Factor 75 stands on the idea that having nutritious and healthy meals shouldn’t be a hassle, so they base their meals on the ability to provide performance drive people with the ability to optimize their lives by delivering meals that are healthier, less time consuming, with healthier ingredients. Factor 75 works alongside trainers, chefs, nutritionists, and doctors to provide meals that will give individuals the proper nutrients that you need to live a fit and healthy life. Factor 75 works in a way where you order your meals a week in advance, which means that you have them delivered a week after you place your order. All meals that Factor 75 sends out are free from hormones, gluten, GMOs, soy, and are based on grass-fed, pasture raised animals that are 100% organic and preservative free, which means you don’t have to worry about where your food is being sourced from. A lot of other meal delivery services source from food that isn’t healthy for you; they have a lot of extra preservatives and hormones in their foods, which isn’t healthy at all. What are the prices on Factor 75? Depending on the meal, Factor 75 charges between $11 – $15 a meal, which can provide you with a bill between $60 – $200, depending on how many meals you decide to order with Factor 75. The more meals you order per a week, the lower your cost per a meal is going to be. Factor 75 bases their bases their delivery fee off of your location. At any time, you can pause, change, or cancel your meal plan, which is super convenient, especially if you plan on doing any traveling or if you’re having financial problems. This is what Factor 75’s price ranges look like if you were interested. Through the chart above, you can tell that the more meals you order, the more money you end up saving. Factor 75 delivers meals Monday through Wednesday and are typically shipped via FedEx. This company never freezes their meals, so all of their meals come in a shipping box that has frozen gel pads and a lot of padding, to keep the meals cool and fresh. How do the meals taste? Personally, I’m someone who likes a lot of salt and condiments on my meals. I’m also someone who is following a keto diet so when I tried the Factor 75 meals, I did find that I wish the meals came with some extra salt/spices, but I know it’s easier to add to the meal than to take away spices! Besides my picky taste with seasoning, I have to say that I really enjoyed the meals that I tried, because everything tasted fresh! All of the vegetables that I tried had a nice crisp freshness to them, so it wasn’t like I overcookedoked, old veggies. I did find that some of the meals that I tried (such as meals with anything mashed) weren’t super visually appealing when I opened them up. But, don’t let that stop you from at least trying a bite, because I haven’t had a meal that I’ve tried from Factor 75 that I’ve been disappointed with yet. A lot of people really enjoy using a meal delivery service because they don’t have to cook a whole lot in order to be able to eat a healthy, nutritious, and delicious meal. You don’t have to think about grocery shopping, any prep work, recipes, or anything like that. You can literally walk in the door after a hard day at work, pop a meal in the oven, and have dinner 5-10 minutes later. Factor 75 is also great for people who love to eat, but hate cooking (or don’t have the option of cooking). I think Factor 75 could be great for people who live in apartments or in a city, where you don’t have a huge kitchen to messy up every night. In the long run, you’re going to end up saving money, because you’re not wasting any food, since everything comes pre-made. You won’t have the oppurunity to stick something in the back of the fridge and forget about it, like you would if you went grocery shopping every week. If you happen to be someone who isn’t super talented in the kitchen, a meal delivery service can also help to guarantee to you that you’re getting a good variety of food in your diet, because you won’t be cooking (or ordering!) the same foods over and over again. With Factor 75, you’re choosing to pay for a service that will provide you with well balanaced meals that you may have never had tried out on your own. One of the most common complaints that people have about any meal delivery service is that there’s a lot of waste generated through the service. Each meal you get comes wrapped in a plastic and paper container, while all of the containers come with a bag or a box. There are some companies out there who are compostable containers, but this doesn’t do any good if you or your community don’t have a compost pile, because you’re still going to have to throw it away. A lot of meal delivery services also use polystyrene single use coolers that can’t be re-used or recycle, because they disintegrate, which is also extremely wasteful! Website is easy to use, easy to navigate If you’re looking to feed your entire family, this will be extremely expensive. Program works best with feeding a single person or a couple. Food choices change every season Packaging needs some work. I would prefer my food to not be touching so nothing gets too soggy or mix when it shouldn’t. Meals are delivered right to your door and you don’t have to be home to accept the delivery Mashed meals don’t look extremely appetizing. Meals are never frozen, but you have the option to freeze them yourself. Easy to cook ahead of time and store. Their containers are even resuable! Gel packs are a bit wasteful, as there isn’t an option to send them back to be re-used again. You have to throw them away. Maybe you’re interested in finding a meal service delivery that works for your style of life, but Factor 75 just isn’t the right one for you. Don’t worry, we still have other options for you to look at! Galley Galley foods deliver meals that are completely prepared and chilled, so all you have to do it reheat them in an oven for ten minutes (or two minutes in the microwave). Meals can cost anywhere from $10-$16, including the taxes, delivery fees, and gratiuity. There are no minimums, no subscriptions, and no other commitments you have to make with this company. You can order whenever you want, as often as you want. Just make sure that you order a week in advance or before 5 PM in order to secure a delivery time frame that works the best for you. Galley Foods are only available in Washington D.C. and Baltimore, MD, but they’re working on expanding. Magic Kitchen Magic Kitchen offers a wide variety of meal delivery services that can be tailored to any special needs you have; low carb diets, gluten free, diabetic friendly meals. You can choose whether you want to have your meals shipped out weekly, bi-weekly, or monthly without ever having to place your own orders, through their auto-ship program. When entering their program, you tell Magic Kitchen what you like to eat, what you don’t like to eat, any allergies, and any goals you want to accomplish with your meals, like losing weight. You don’t get to choose your own meals; Magic Kitchen creates a rotation of menus based off of what you want, what you like, and what your goals are. They send these meals off to you on your own schedule. Home Bistro Home Bistro comes with several vegetarian options, like mac n cheese with creamed spinach and kale, spinach and ricotta cheese stuffed eggplant roulade with kale and snap peas. Shipping and taxes aren’t included in the cost of the meals, you have to pay extra for shipping and taxes. If you purchase seven meals for $82.99, shipping costs will be an additional $21.95. Personal Chef to Go You don’t have to worry about Personal Chef to Go with this company! You can choose to sign up for weekly or bi-weekly auto shipment program. They offer a nine-week rotating menu that doesn’t contain any items that have a 30% of total claories from fats, 40% in complex carbs, and 30% in lean protein. Personal Chef also offers a combo of meals that go along with salads or a family dinner with rolls and sides. Packed in ‘oxygen free packaging’ in order to preserve the food for other ten days, which takes away the concept of freshness. Food is delivered 48-72 hours after it’s been prepared, which also isn’t very fresh. There are a whole lot of reasons why someone can benefit from a meal delivery service; maybe you’re single and cooking for one person just doesn’t make sense. Or maybe you’ve just started working longer hours and you’re looking to create a healthier life style for yourself. Whatever your circumstances happen to be, you certainly don’t deserve frozen meals like Lean Cuisine that are jam packed with non-nutritional foods and are full of salt and preservatives. A food delivery service such a Factor 75 is a semi-affordable food delivery option that will provide you with pre-made meals that are healthy, nutritious, and delicious!